Gorgeous 1,335 square foot 2 bedroom 2 storey townhome located in the Terwillegar Commons neighbourhood in the City's SW. 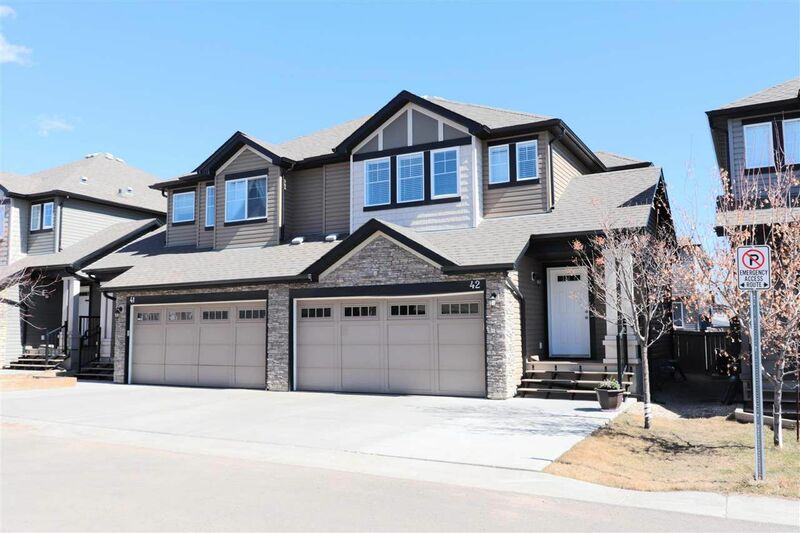 Step thru the front door to a welcoming Foyer that leads to an Open concept living room with gas fireplace plus large windows to the rear yard and deck. Kitchen comes with stainless steel appliances (including a gas stove & above range microwave). Family sized eating area with access thru a sliding door to the nicely landscaped yard. This yard features blueberries, Saskatoons, Raspberries, Strawberries as well as Honey berries. There is a handy 2 piece bath on the main floor too. The upper floor has 2 Master Suites, each with their own 4 piece ensuite plus a Family Room and Laundry area. The fully finished basement has a rec. room, wet bar, a 3 piece bath and storage. The double attached garage is insulated for your vehicles comfort. Air conditioning. Situated in a well run complex, this bare land condo is close to shopping & schools. Low condo fees at $122 per month. Move in ready!